Another great looking Friday and another road trip to a race greeted me upon awakening on this Friday morning, February 6, 2015. I had a long drive ahead of me that would end in Maysville, NC which would be a little over eight hours away. Leaving on a Friday for a Saturday race is fairly common and usually no trouble. But, this one had a wrinkle in it. This 50-miler would start at 12:01 a.m. on Saturday morning. That’s one minute after midnight, not the usual starting time of six to eight o’clock with the sunrise. So, I would have to leave very early on Friday morning in order to arrive in Maysville and take care of pre-race details. Very early in this case would be about 4:30 a.m. I headed out Georgia State Road 138 in the darkness and headed east so I could run into Interstate 20. The interstate would take me to I-95. That would take me to some back roads in North Carolina as I snaked my way to Maysville. Now, I like back roads, and I thoroughly enjoyed finding my way to Maysville through the countryside. It was some more of America the beautiful. Some organizational problems that were unique to this race because of the starting time added to the need of precision in my schedule. I had to arrive in Maysville and locate the Highway 55 Diner which was on highway 58. Their parking lot would be the starting line location. Next, a motel. Google gave a motel location eight miles north of Maysville in Pollacksville. None in Maysville. The problem was that the motel in Pollacksville was gutted and not open for business. So, that sent me back to Maysville and on to Jacksonville…fifteen miles south of Maysville. Jacksonville is a significantly larger town, so finding a motel was no problem. I checked in trying to explain that I may need an extension of the check-out time so I could get back from the finish, get cleaned up and head home. They gave me an hour. I took it. I didn’t think it would be enough. It wasn’t. Next, I had to eat. That would be “the” meal before the race in about six hours. Also, I had to get gas. So, I put it together and made a trip for gas and food. Gas for $2.11 per gallon and a Big Mac for the meal. I was set. Back at the motel, I got dressed for the race after checking the hourly temperature forecast. It was going to be cold. I decided to wear pants, windbreaker, and gloves. I would wear a headlamp over my cap. I had to drive to Emerald Island to park and get a ride back to the start at the diner. The ride was arranged through the race management. After finding the parking lot, I got my drop bag and climbed into the minivan. Karen Jackson was also there for a ride. She would be the only runner I knew in this race. I had met her in the Last Annual Vol-State Road Race last summer. She is one tough runner, and I figured this ride and time at the diner would be the only time I would see her. Once the race started, she would be gone. The ride took me and five others to the diner in Maysville. We would wait there for the start. I had a grilled cheese sandwich and hot chocolate about seventy-five minutes before the race. I finalized my preparation for the race as the pre-race meeting told us the vital information we needed to know. The moon was almost full and threw moonlight over the road as the seventeen entrants gathered in the parking lot for the start. We would run twenty-two miles on the road before we hit the beach. I was not looking forward to running in sand. And, we had about twenty-six miles of the stuff before we ended up running on the road again to the finish at Ft. Macon State Park. I was last leaving Maysville but felt OK with my pace and effort. As the miles passed, I gradually moved up but still didn’t know my place and really wasn’t worried about it. I just wanted to run efficiently and have something left for the dreaded sand. It was going to be a lot harder to run in the sand than on the road. I was not looking forward to it. In fact, I dreaded it, and that made it a big problem…and I wasn’t even there yet. I tried to be more positive as we got closer to the beach, but it turned out that I just became more positive that I was going to hate it. I felt good on the road running in my Hoka Cliftons which I was wearing for the first time in a race. And, somewhere up ahead was Karen Jackson running in her sandals. I was leap frogging a couple of runners as one would slow down and then speed back up and the other would intersperse walking breaks in his running. I could see runners up ahead with their headlamps turned on. In the darkness, I could see light circles on the road where the runners’ light beam hit the pavement. This served as a way to judge the distance to those runners, and I could gradually gain ground on them. It worked pretty well. I did not use my light because I could see well enough from the moonlight. Of course, it made me hard to see by the other runners. We crossed the bridge that put us on Emerald Island. I had come up behind a couple of runners and followed them to the beach access. We entered the beach traversing a small sand dune. The access point was marked by a flashing red light. The beach was wide and almost flat at this point. I saw this and thought that it was going to be better than I had envisioned. I was wrong. While running the three miles to the first beach checkpoint at which our drop bags were located, the running quickly became what I thought it would be…terrible. I passed some runners by getting in and out of the aid station quickly. 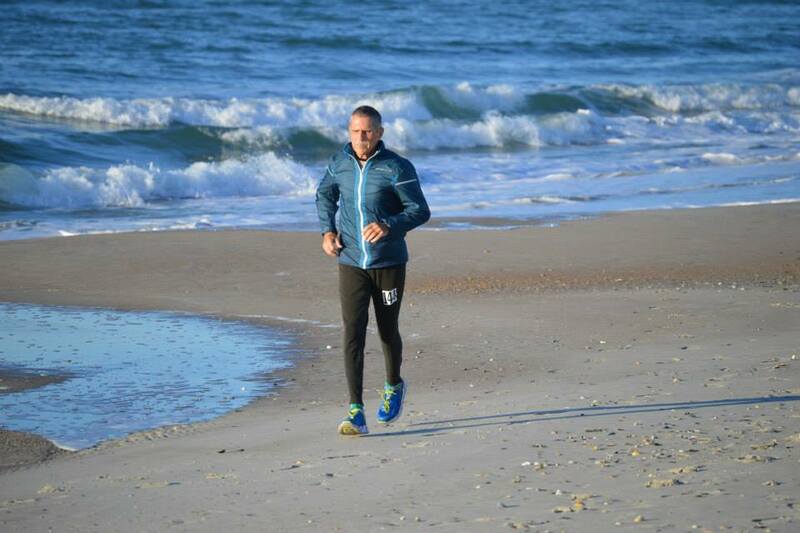 I continued running north on the beach trying to find some harder footing. Most of the time, I would sink into the sand and have to work harder to run slowly. The sky was black and pinpointed with stars. It was windless. The workers at the previous station told me that it was six miles to the next station. For me, running on the beach made the miles seem twice as long. The six miles turned out to be wrong. It was seven and a half miles. And, it was the same to the next aid station. I was not having fun. Even though I hated it, I was running OK so far. I was leapfrogging a couple of runners for most of the way. We had a beautiful sunrise as we ran. The headwind I was worried about did not exist. That was one good point. With about five miles to go, I could feel myself crashing. I blamed the sand and the race director, the son-of-a-beach,…and anyone else I could think of at the moment. I put myself into a run-walk mode to finish this thing. The two runners I was leapfrogging earlier ran away to finish ahead of me. I blamed them also. One was Karen Jackson. I blamed her sandals. I reached the northern point of the island which curved into a sound. This was Ft. Macon State Park. Naturally, the sand got deeper and softer. We had to punch our race numbers at two points in this area so we could prove that we ran this section on course. The finish was just to our left across the dunes, but we had to run the long way around. Thus, the two check points. Running along the beach. Photo taken by Susan Scott. I was running slowly around the bend looking for the beach departure point. That would put me back on roads and make me a little happier. Still tired, still crashed, still burned, but still moving forward. I hit the pavement running, albeit very slowly. From there, it was one and six tenths miles to the finish. I felt like I could make it at that point. But, I still wasn’t sure. I pushed it on in and ran into a parking lot at the fort. The time was a not-so-blazing 10:53:16.09 for seventh place overall. At that point, I would take it and be happy with it. I was just glad to have the beach behind me. I sat in the nearest chair, received my unique finisher’s award and the shirt. The award was a fruit jar filled with samples of the surfaces we ran upon. They were layered starting with sand, dirt, and then chunks of asphalt on top. Like I said…unique. I drank a cup of Dr. Pepper, had some conversation, and then got my ride back to the parking lot where my truck was parked and I had started this adventure. But, it wasn’t over. After arriving at the parking lot, I fished my key from my pocket to unlock the door. That’s when I found out I had a flat tire on the left rear. Just what I wanted after running 50-miles through the night and struggling for twenty-six miles of that in sand. Son-of-a-beach! The flat tire was a reminder of last summer’s Last Annual Vol-State Road Race. I had finished that race of 314 miles and then walked back to the parking lot which was, maybe, three-quarters of a mile from the finish. At the truck, I found I had a flat tire. So, time and effort was spent changing the tire. Son-of-a-beach! OK…my second 50K ultramarathon in two months, the first one this year being in October in Greenville, SC which will probably not happen again if it is on the same course. Fast forward to November to Peachtree City, GA for a better and more enjoyable 50K. For one, they didn’t change the course overnight, so that helps. Two, I didn’t fall down, knock myself dizzy, and lose time getting my head back on straight…so that helps a lot. Third, oh…there is no third…I did take a wrong turn (actually, didn’t take the turn) like I did at the Swamp Rabbit, but I didn’t lose as much time as I did in Greenville. I drove the short drive from Jonesboro, GA to Peachtree City, GA in the neighboring county. Peachtree City is a planned city and has a network of paved multi-use paths. The place is agog with golf carts going everywhere. Teen drivers get cited for reckless driving on the paths as they hot rod their dad’s golf cart. Only in America! But, on this race day, the golf carts were at a minimum. The weather was cool but comfortable. The race wasn’t overly crowded and one had room to run at your chosen pace. I was here to run a good, steady pace without too much variance. It would serve as a workout for later ultras in 2015. At least, that was the plan. I started comfortably and kept it steady sticking to my plan and feeling good. The course was good, picturesque, and enjoyable. I was cruising along on the first of five loops of 5.18 miles and scoping out the competition. Was he in my age-group? Can he keep that pace?…I don’t think so. That guy looks like he is gaining on me…so around the next curve, I’ll surge a bit. I think I can catch that group in the next two loops. Gotta keep good mechanics, pay attention to my form. Be efficient. RFM. The positive self-talk seemed to help. At least, I felt better than in the Swamp Rabbit 50K. But then, this course was easier. Then, I reached the out & back finger that we run before coming back by the starting line to complete a loop. On the out section of the finger, I approached a gaggle of ladies out for their fitness walk. They were enjoying the morning and talking loudly and walking briskly. I gave them a friendly “hello” as I passed them looking for my turn-around mark. I continued running and began to wonder where that turn-around mark was and what it looked like. When I finally reached a split in the trail and entered a neighborhood, I decided I had missed the mark. How much time I had lost, I did not know. I begrudgingly reversed my direction looking for the turn-around mark that I assumed I had missed. Should I run faster to make up lost time or run slower to save some energy to use once I was on the race course? I didn’t really know. So, I chose the latter and jogged until I found the mark. There it was. Right in the middle of the path, painted on there in a large, white circle with a turn-around arrow showing the reverse direction. And, I missed it! Thinking back, I know how I had missed such an obvious mark. That gaggle of women out for their morning walk was right on top of the mark, and it was hidden from my sight as I passed them. So, I just kept running down the path. Losing time. Just like at Swamp Rabbit. Once I got back to the mark and saw it, I just stopped right there, looked at it, and loudly (too loudly) said, “Sh*t, sh*t, sh*t!” Then, I heard a small voice somewhere behind me. It said, “That’s not vewy nice.” I turned to see a small boy, maybe four or five years old, who was playing in his back yard. I told him, “Yeah, you’re right. I’m not a nice man, but I will try to be better.” I left the scene with the small tyke smiling. The remaining loops were correct with no missed turns. I steadily moved up in the rankings. I knew more about how I was doing once the 25K runners finished and left the course. I was keeping the pace in a consistent time frame once the first loop with its missed turn was over. I was able to pick up the pace a bit in the last loop. This put me in 9th overall and 1st in my 60 & Over age-group with a time of 5:20:05. I finished. I walked around a few minutes. The clerk brought me the age-group award. I fished out a Coke from the cooler. I drove home. My recovery the next few days was good. I kept my daily mileage in the 8 to 10 mile range with no ill effects. I had no soreness or tightness. Nothing hurt. This put The Swamp Rabbit 50K further back in my memory…and, that’s a good thing. WHAT IS A SWAMP RABBIT, ANYWAY? I drove to Greenville, SC on Friday before the Saturday race. This would be my first 50 kilometer ultra in a long time. I see the 50K as an extended marathon. The 50K usually treats me like an extended marathon would…harshly. However, I looked forward to this run because it would traverse a multi-use trail once it left the Lake Conestee Nature Park. This would run through parts of Greenville and north toward Furman University. It would be an out and back route. Also, I was eager to run this because I DNF my last run, The Pinellas Trail Challenge – 46 miles, for reasons I don’t want to think about. So, I stayed at a motel alongside I-85 upon entering Greenville. I drove to the park to see how long it would take to get there and know what time I should leave in the morning. It was easy to find. I would just have to find the race starting area upon arriving, but that would be no problem. Then, I drove north to see parts of the multi-use path as it passed through parts of Greenville and through some nature areas. It would be fairly scenic most of the way. After my exploration, I ate my pre-race meal. That was the trusted Big Mac Meal at the world famous restaurant chain, McDonald’s. With a full gut, I drove back to the motel for a restful night. The race would start at 7:30 a.m. The weather promised to be relatively cool with partly cloudy skies. I prepared everything the night before and was ready to wake up and leave for the park. I arrived at the park and quickly found the starting area. There were plenty of cars already parked, so it was easy to find. I checked in, got my number, and BAM! I was blindsighted! The clerk told me that the route had been changed from the multi-use path to be 100% within Lake Conestee Nature Park. Now, instead of the long out and back that I looked forward to, it would be five 10 kilometer loops, with most of it on nature trails and a little bit on the paved part of the Swamp Rabbit Trail. There would be an aid station at the five kilometer mark of the loop. I was extremely disappointed when I got this information. I was depressed. The reason for the change was that the city had closed a bridge over which the course ran. Some construction on the bridge was the cause of the closure. Luckily, they could modify the race to the 10K loops. That would make race management a lot easier. But, my mind was jangled with mixed emotions about this race. Right off the bat on the first loop, I took a wrong turn. Actually, I didn’t take a turn that I was supposed to take. I barged straight ahead and eventually met runners coming toward me. I made it back to the course after losing about 10 to 15 minutes. Great start! And, things would get worse. I was chasing two runners that I could see up ahead. I eventually paced myself to gradually catch up and pass them. Then, later in the race, I learned that those two guys were ahead of me by a whopping amount of time. But, they never passed me. Something was wrong. They had taken a wrong turn like me, but theirs’ was a lot worse. And, they never corrected their distance. But, they got credit for the 50K with a better time than mine even though they ran a significantly less distance. Without the correction, the race management should have listed them at the bottom of the results. Their names should have been asterisked with the distinction of running a short course. That seems logical to me. Obviously, the race management didn’t think it was worth while. So, I was listed behind two guys who ran shorter. Must be a swamp rabbit thing. A Get Out Greenville festival was going on in the park while the race ran. That added a little variety and excitement as the runners passed the start-finish area. There were people everywhere. A lot cheered the runners, some just wondered what was going on with those people, the runners. Either way, the environment helped the race at that point. I changed my race thoughts with the course change. I went out slower than originally planned because of having to repeat the hilly trail course five times. After the 50K runners were on their way, the 25K runners started at 9:00 a.m. Naturally, the 25K runners ran at a faster pace than us 50K runners. So, when they buzzed by me, I subconsciously picked up my pace. I ran the second loop faster than I had planned. But, it seemed OK. I felt fine. I felt fine until I managed to fall harder than any fall-while-running that I can remember. I just ran a slight downhill and had the slight increase in speed. At the bottom, my left foot found a root, caught it, and did not stride forward. That put me in a fall while being twisted to the right. My arms and hands didn’t make it out to break the fall. My left shoulder, left ribs, and head broke the fall. My ribs hurt then and afterwards through the rest of the race. I thought I might have cracked one because it felt like my cracked ribs that I have had in the past. My head hitting the hard ground in a whiplash fashion resulted in being dizzy and light-headed for about 15 minutes after the fall. I walked a lot during this dizzy period in order to get my head back on straight. Of course, I lost a lot of time to add to the lost time in the wrong turns. And, this was the highlight of the race. The day was one of great weather…not too hot, not too cold. My 10K loops sped up as the race progressed, and I recovered somewhat from the fall. For me, primarily a road runner, it was a hard course. It was a hilly course. And, when I was on the ground, it was even harder. I finished in 6:28:03 and in 13th out of 14 finishers. I managed to out kick an alien female who had two antennas protruding for most of the race. Afterwards, I lay in the sun and enjoyed the warmth and the inclined position. I watched the people enjoy the festival. After some rest, I wobbled over to ride a geared peddle machine somewhat akin to a four-wheel cycle. It even had an electric motor to assist with the start when the pedaling required a a lot more effort. It was fun. The race director spoke of having the event on this same course next year because it was so easy to manage. All the runners stayed in the park…not spread out all over Greenville. If it is on the same course, the swamp rabbit will have to get along without me.